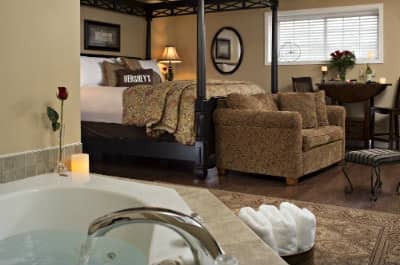 At 1825 Inn, the Hershey Sweet Cottage is a favorite for honeymoons and romantic getaways in the Hershey, PA area. Tucked into the trees away from the Main House, this lodging option offers quiet tranquility and the most privacy on the property. 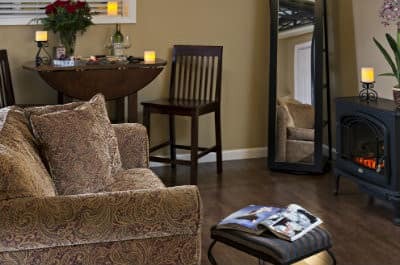 While the cottage has a more upscale, urban feel than most of our guestrooms, it still offers a sense of warmth and comfort. Light-colored walls offset the mix of dark woods throughout the space, and the cozy oversized chair invites you to snuggle in with a good book. 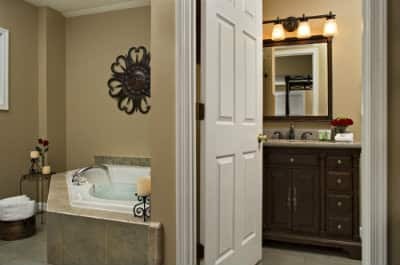 A two-person Jacuzzi is tucked into a corner for a relaxing bath, and thick robes are available after use of the five-foot, dual-head shower. A plush pillow-top mattress offers a great night’s rest.In the morning, take a cup of coffee out to the private deck, where a wood glider for two overlooks the gardens. Then come up to the Main House for a delicious breakfast.The Hershey Sweet Cottage is an ideal place for a secluded getaway, a relaxing vacation, or even a romantic proposal!